MOMocrats Founder & Managing Editor Glennia Campbell is the blogger behind The Silent I. Her first political memory is helping her mom scrape the "Wallace for President" sticker off the family's '68 Fiat. Despite being raised in a mixed marriage (Dad is a Caucasian Republican, Mom is a Korean Democrat), she found her way to Democratic politics under the tutelage of the late Rev. Dr. William Sloane Coffin, Jr., Cora Weiss, and other anti-war activists and leaders in the anti-nuclear campaigns of the 1980's. Glennia is a lawyer and lifelong volunteer. She has been a poverty lawyer in the South Bronx, a crisis counselor for a domestic violence shelter in Texas, President of a 2,000 member non-profit parent's club in California, and has worked in support of high-tech and medical research throughout her professional career. She has traveled with her husband and young son to over 20 countries and lived to blog about it. 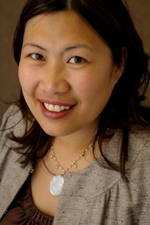 She is also a contributing writer to The Silicon Valley Moms Blog, Kimchi Mamas, and Moms Speak Up. MOMocrats Founding Editor Stefania Pomponi Butler is a writer and blog editor/producer who is known for her irreverent and delicious personal blog, CityMama. She is also interested in social media outreach and PR-blogger relations. Her childhood was spent running around the Hawaii State Capitol building where her mom worked for a state representative. (Senator Daniel Inouye's office passed out candy to kids.) She also spent many punishing hours of her childhood standing on street corners holding campaign signs and waving at cars because her mother is a mean, mean politically-obsessed lady. At age 24, after serving one term as a commissioner, she became the youngest ever Chair of the Arts Commission for the city in which she lived. Trivia time! Stefania was born in the same hospital and went to the same school as Barack Obama. Even though she is mixed-race like Obama and a woman like Hillary, she voted for a white guy—John Edwards—for president in the California primary (absentee) because she supported his healthcare, poverty, and nuclear initiatives, and she wholeheartedly agrees with his ideas on how the U.S. should restore its reputation and re-engage with the world. She now rides around her Silicon Valley town with a MOMocrats.com bumper sticker slapped onto the rear of her car, and an an Obama bumper sticker adorning her bike trailer. She has hope that we will not be stuck with another deluded idiot running our country for the next four years. Yes we can! Stefania often speaks on blog-related issues. MOMocrats Founder & Technical Editor Beth 's (or TechMama) first involvement in politics was volunteering at a California State Democratic convention many years ago just after she graduated from college. After that she followed politics closely from behind the scenes. Beth was initially inspired to start getting involved in politics again by Elizabeth Edward's courage and ability to stand up for what she believes. Beth came out in support of John Edwards after spending time reading his plan to build one America and hearing him speak. Coming from the technical perspective, she thought blogging would be the best way to do it. Joanne Bamberger is the blogger better known as PunditMom. Joanne has been a Democrat and a political junkie since her high school days. The highlight of her senior year wasn't the prom -- it was going to the mock presidential convention at the local college. 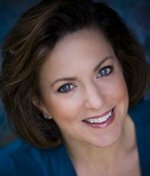 A former broadcast journalist, Joanne is also a "recovering" attorney, a professional freelance writer and an adoptive mom who is passionate about being involved in politics and luring others into her political web. While Joanne has lived most of her life on the East Coast, she went to college and law school on the Midwest, which gives her an 'outside the beltway' perspective on many issues. Her seven-year-old daughter, "PunditGirl," is glad that George W. Bush's "turn will be over soon." In addition to her own blog, Joanne's writing can be found at DC Metro Moms Blog, The Huffington Post and PunditMom's Spin Cycle, among others. She has also written for a variety of national and regional outlets including MSN, Marketplace Radio and The Washington Post. Stephanie Himel-Nelson is a lawyer from South East Virginia. She grew up as an Air Force brat and has lived in many places inside and outside of the United States. With a husband in the Navy Reserves and a brother in the Army, politics is personal for Stephanie. She attended the University of Miami, the University of Nebraska at Omaha, and George Washington University Law School. As a law student, she interned at the Pentagon with the Department of the Army before moving on to private practice in the D.C. area. Stephanie is now a government contracts and construction litigator in private practice in Norfolk, Virginia. Stephanie's alter ego is Lawyer Mama, where she writes about life as a working mother of two small boys. She is also a contributing writer for the DC Metro Moms Blog. Jen has been working with homeless and at-risk families, adults and youth since 1997. She's spent her life in the non-profit sector and champions equality of class, gender, and race and the alleviation of human suffering. In her spare time she chases her kid around and backpacks through distant parts of the world. It's a big world - we should see as much of it as we can. Jen also blogs regularly about poverty, homelessness and keeping one step ahead of her child at One Plus Two. Debbie grew up in an evangelical Christian household in Portland, Oregon, and fled from the religious net in her early twenties. Later, in November of 1999, after ceasing to be apathetic, she voted for Al Gore. Saving local papers in days after the election aided in healing her heartbroken reaction to its results. She began blogging at i obsess in April of 2006, and gladly joined the MOMocrats in fall of 2007. She tends to discourse on the experience of being a mother with questionable sanity issues and hardened political beliefs, while running a business and a home, and rearing a toddler with old-fashioned values. You heard her. Sheila Bernus Dowd blogs at Xiaolinmama and StarfishCircle. 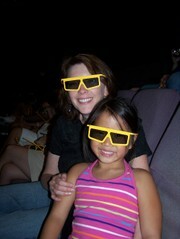 Sheila is also a contributing writer at Filipina Moms Blog and Silicon Valley Moms Blog. Sheila has worked as an advocate for youth for over a decade in Silicon Valley, from counseling young adults as they started public sector careers, serving on local boards to co-leading a county-wide effort to engage all adults in Santa Clara County to take responsibility for all our kids. Since becoming a mom with "real issues", she has been involved with local politics including, managing a councilmember's campaign. While not all of her candidates have been successful, her kids have enjoyed many free ice cream cones for being willing to be photographed in candidate campaign literature. Alisyn Cobb shares what has to be the smallest house in Silicon Valley with her husband, two adorable daughters, and a whole lot of books and magazines. She is proud to be a MOMocrat, and has no plans to take the John Edwards '08 bumper sticker off her car anytime soon. Kady is a new lawyer and a new blogger at Loaded Dice. She has two daughters who are both the reason and bane of her existence. Kady first got involved in politics at the tender age of 17, when she quit school for a semester to be the student campaign manager of a local Democrat's successful bid to unseat a multi-term Supervior. She then spent the summer before college working as an intern at her Congressman's office in Washington D.C. In college, Kady majored in environmental policy and spent all her free time pressuring her school to improve their recycling and purchasing policies. But then her heart was broken when two of her most cherished political mentors became embroiled in career-ending scandals. Cynematic is a Los Angeles-based writer-filmmaker who blogs at P i l l o w b o o k. Since 2003, she's alternately vented about politics and told stories about her son there. Past jobs held include drugstore cashier, phone telemarketer, paralegal, graduate teaching assistant, researcher for a tv documentary series, and freelance book reviewer/editor. She was a foot soldier (canon fodder, so to speak?) in the culture wars of the '90s at UC Berkeley and is a recovering academic who's published scholarly articles about Asian American popular culture, film, and literature. Like most progressives, she's voted for more presidential losers (Dems) than winners. Only this year has she felt a glimmer of hope that at the start of the election cycle Democrats had bench depth with three viable, smart, and capable candidates. Even so, she's been Obama all the way. She's hopeful about '08 because she's gotten used to the sunny climate in Southern Cali and Canada is not an option. Julie Pippert is a writer, editor, and publisher of legal, business, technical, and medical topics. She became interested in politics in high school, and first used her power to vote mere days after turning 18. During college, she worked on local political campaigns (including one fun and feisty governor), and eventually landed a spot as a speech writer for a presidential contender (who ultimately lost). "I believe it's important to not just speak through our votes, but to use any avenue possible to get our views out there before the vote. We need to let candidates hear what matters to us, what we think," she says, "And that's why I'm so excited to be a part of MOMocrats." Julie also is a contributing writer at Moms Speak Up, and you can find her daily at her personal blog, Using My Words. Bitsy Parker is the blogger behind Value wIT, a hilarious look at what she calls "societal berzerkism." Value wIT was selected as a Typepad Featured Blog soon after its launch. According to Typepad, "Bitsy Parker is not your average mommy blogger...typical mommy blog traits are secondary to the style, sass, and smarts of the writing on Value wIT. Bitsy Parker challenges society's common thought, endorses good values, all the while making us laugh from an uncommon lens of a woman's every day life in Austin, Texas. Parker admittedly uses her blog as some kind of therapy or venting machine so that she doesn't wear down so many of her friends' patience, but instead we find it therapy of our own. Turn to categories Societal Berzerkism and Motherdumb first. In the meantime we'll ask Bitsy if she could please add a warning label to her blog; reading Bitsy Parker leads to laughing out loud, gut aches, and the possibility of falling off your chair." Melissa is a policy analyst for a small nonprofit in Washington, DC. It will surprise no one to learn that she hails from Boston, one of the bluest cities in the nation. She and her husband, one of those lefty academics, reside in Baltimore. They'd like you to know that their city isn't only what you see on The Wire. Her first foray into politics came in high school when she lobbied the governor to pass the Safe Schools Act. Her career began in earnest when she started working for NARAL Pro-Choice America six days after graduating from college. After a couple of years, she heard the siren call of the private sector and went to work for a consulting firm. Two soul-crushing years later, she returned to the non-profit world having learned that money isn't everything. Melissa and her husband expect their first child, a girl, in mid-to-late April 2008. You can read about her pregnancy at their blog, 21st Century Kid. She is also a contributing writer for Free State Politics. Liz Gumbinner of Mom-101 and Co-Founder & Editor of Cool Mom Picks, is a born and bred New Yorker but without the accent. She’s had a successful career as a creative director in the Prada-mandatory world of advertising, has helped found a grassroots organization that assists Bosnian refugee children, writes some parenting columns here and there, and is the co-author of Booty Food (Bloomsbury USA), a humorous relationship guide and cookbook. Liz is equally at home in the boutiques of Fifth Avenue and the aisles of Target, but can most often be spotted around her Brooklyn neighborhood with the love of her life and their two daughters, trying to coax their stubborn English Bulldog across the street. Kristen Chase took the plunge into motherhood via a surprise pregnancy and is now knee deep with a three year old daughter, one year old son, and one more on the way. In her former life she was a published textbook author, musician, and college professor all of which she's traded for a satisfying new position as military wife and stay-at-home-parent. Kristen is the author of the widely popular weblog Motherhood Uncensored, and writes Mominatrix, a featured column at The Imperfect Parent. Additionally, she is co-founder of Cool Mom Picks, a cheeky product and service review blog for discerning moms, as well as Parent Bloggers Network, a blog marketing agency connecting bloggers with products and services. She recently moved to Atlanta after a year-long stint with her in-laws. The only politics Kristen enjoyed was on various sub-committees at her former university position, but since entering parenthood and watching several of her friend's spouses (including possibly her own) head out for long deployments, she's decided that she needs to take a bit more of an active approach in the political climate on the United States. She's not a registered anything just yet, but she's 100% certain she looks way better in donkey than elephant anything. Sarah Granger was born to Republican parents in a Republican town in a Republican state that now has a Democratic woman governor. Sarah’s dad’s childhood buddy, "Hartpence,” later became U.S. Senator Gary Hart. Her mom was managing political fundraisers while Sarah was in utero, and their house was down the block from the author of What's the Matter with Kansas?. Sarah was first introduced to a computer at age 9, and she took an interest in technology policy in 1987 after one of her BBS friends was imprisoned for hacking. 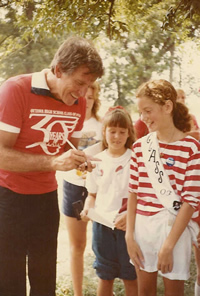 After graduating from the University of Michigan and working in computer security consulting and Internet start-up management, Sarah focused on non-profit and political organizations where she directed the launch of what Wired News and political analysts called the “first true weblog to be put up by a politician,” the Gary Hart News Blog. Sarah completed the Emerge California women’s political leadership program in 2005 and she currently serves as one of two representatives from her local Junior League to the State Public Affairs Committee. She is a frequent panelist and speaker for conferences and media outlets including BlogHer ’07 and ABC News: Good Morning America. She has been quoted or mentioned by a wide range of news sources from Daily KOS to The New York Times. Sarah blogs as Sairy, for the Silicon Valley Moms Blog, SFBayStyle, Playborhood, and as a Guest Editor for BlogHer. A more detailed bio can be found here. Jaelithe is an internet marketing writer, search engine optimization consultant, semi-pro navelgazer, and happily married mother of one quirky red-headed kid. She spent her formative teenage years living hand-to-mouth in a low-income, single-parent household while attending one of the most exclusive, expensive private schools in the country— on scholarship. This study in contrasts not only gave her a unique perspective on class relations, but also taught her to argue politely and well with extremely sheltered Republicans. Her hobbies include gardening, reading obscure early 20th century Argentinian literature, quoting Ben Franklin, and obsessively checking the internet for political news. She writes a personal blog called The State of Discontent.